The School Board of Brevard County has made changes to the boundary maps for some Brevard County Public Schools. The changes will affect students living in Mims, Titusville, Cocoa, Cocoa Beach, Viera, Melbourne, Eau Gallie, Satellite Beach, Patrick Air Force Base, Palm Bay, and Malabar. The details of the changes are listed below the maps. Click on any map to enlarge. Proposal #1. At the School Board meeting on January 24, 2012, the Board voted to approve the staff recommended Option H with the exception of the area shown being redistricted from Cocoa Beach Jr./Sr. High to Satellite High. That change is not included in the proposal; it is part of Proposal #2 and was shown for reference only. North- Start at the intersection of Pineda Plaza and Wickham Rd., east on Pineda Plaza to Pineda Cswy., east on Pineda Cswy to the Indian River. South- From the Coquina Ridge Sub south boundary and Indian River, west on boundary line to east boundary of Wickham Forest Subdivision, south on this line to the south boundary of Wickham Forest Sub., west on this line to the west boundary of Wickham Forest Sub., north on this line to the south boundary of Wickham Forest Sub., west on this line to Wickham Rd. West- From the intersection of Wickham Forest Sub and Wickham Rd. north on Wickham to beginning. North- Start at a point on the Osceola and Brevard County line west of the north boundary of the Windover Farms of Melbourne Subdivision, east on this line to the east boundary of Windover Farms of Melbourne Sub., south on this line to the north boundary of the Post Cascades Subdivision boundary line, east on this line to Wickham rd., north on Wickham Rd to the south boundary of the Forest Run Subdivision, east on this line to the west boundary of Wickham Forest Subdivision, south on this line to the south boundary of Wickham Forest Sub., east on this line to the west boundary of Wickham Forest Sub., north on this line to the south boundary of Wickham Forest sub., east on this line to US 1, south on US 1 to the south boundary of Coquina Ridge Subdivision, east on this line to the Indian River. East- From the south Coquina Ridge Sub. boundary line and the Indian River, south on the Indian River to the south boundary of the River Palms Condo Complex. South- From the south Coquina Ridge Condo Complex boundary line and the Indian River east on this line to US 1, north on US 1 to Post Rd., west on Post Rd to its end, then west to the Osceola and Brevard County line. West- From the point west of the west end of Post Rd and the Osceola and Brevard County line, north to the beginning. 3. The Board approved Option for Proposal 1 of the Recommended Conditions to grandfather all current rising 10th graders at Viera High. 1. The south boundary between Cocoa Beach Jr./Sr. and Satellite High as well as the boundary between Cocoa Beach Jr./Sr. High and DeLaura Middle will move to the north boundary of Patrick Air Force Base. 2. The Middle Years IB boundary between Cocoa Beach Jr./Sr. High and Clearlake Middle School was moved to the Banana River. Students living north of the Pineda Causeway on both Merritt Island and the mainland are redistricted to the Clearlake Middle Years IB Program. 3. T he Board approved grandfathering rising 8th grade MY IB students currently at Cocoa Beach. 4. The Board approved giving Middle Years IB students who attended the Clearlake MY IB program a guaranteed place in the Cocoa Beach Middle Years program for 9th grade. 5. No parts of the Alternative Option were approved by the Board. Proposal #3 - At the School Board meeting on January 24, 2012, the Board voted to approve the staff recommended Option D, with the exception of the area shown being redistricted from Cocoa Beach Jr./Sr. High to DeLaura Middle. That change is not included in the proposal; it is part of Proposal #2 and was shown for reference only. North- Start at a point on I 95 and the north boundary of Crane Creek Unity One Subdivision, east on this line to Murrell Rd., east following the north boundary of Viera Tract Phase III to the north boundary of Mandarin Lakes Subdivision, east on this line to the north boundary of the Villas of Suntree Subdivision, east on this line to the Florida East Coast Railway., north on the FEC to a point west of the intersection of US 1 and Frumenti Place., east on this line to the intersection of US 1 and Frumenti Pl., east on Frumenti to the Indian River. East- From the intersection of Frumenti Pl. and the Indian River, south on the Indian River to a point east of Suntree Blvd. and the Indian River,. South- From this point west to Suntree Blvd., west on Suntree to Wickham Rd., north on Wickham Rd. to I-95. West- From the intersection of I 95 and Wickham Rd. north on I 95 to the beginning. North- Start at a point due north of the west end on Sunhome St. and due west of the intersection of Reid Rd. and Clearlake Rd., from this point east to the intersection of Reid Rd. and Clearlake Rd., north on Clearlake to Dixon Blvd., east on Dixon to Pineda St.
East- From the intersection of Dixon and Pineda south on Pineda to School St.
South- From the intersection of School and Pineda west on School to Lake Dr., west on Lake to Clearlake Rd., south on Clearlake to King St. (SR 520), west on King to a point that is due south of the east boundary of the parcel at the southeast corner of the intersection of Tranquility Rd. and Lake Dr.
West- From this point which is due south of the east boundary of the parcel at the southeast corner of the intersection of Tranquility Rd. and Lake Dr., north to northeast point of the boundary of the parcel at the southeast corner of the intersection of Tranquility Rd. and Lake Dr., north from this point to the west end of Sunhome St., north to the beginning. East- South on I 95 to a point due east of the east end of Ralph Williams Jr. Dr.
South- From this point of the intersection of Ralph Williams and I 95 west to Ralph Williams, west on Ralph Williams to its west end, due west to the center of Lake Florence, west to the center of Rockledge Creek, west to Lake Poinsett, west to the intersection of Osceola, Orange and Brevard County lines. West- From the intersection of Osceola, Orange and Brevard County lines, north to the beginning. North- Start at the intersection of Cox Rd and SR 520, east on SR 520 to Clearlake Rd. East- From the intersection of Clearlake and SR 520 south on Clearlake to a point that is due west of the west end of Rosa L Jones Dr.
South- From this point, west to the north boundary of Catalina Village Subdivision where it intersects Burnett Rd., west on this line to the east boundary Catalina Village 1st Addition Subdivision, north on this line to Parrish Rd., west on Parrish until it turns north, due west from this point to the east boundary of Poinsett Gardens Subdivision. West- From this point east which is the boundary of Poinsett Gardens Subdivision north to the beginning. Proposal #5 - At the School Board meeting on January 24, 2012, the Board voted to approve the staff recommended Option G.
North- Start at the intersection of Canal No. 68 (just north of Hamm St.) and Jupiter Blvd., east on this canal to the west boundary of the Malabar Air Force Station. South- From the intersection of MAFS and Canal 1, west on Canal 1 to Jupiter Blvd. West- From the intersection of Canal 1 and Jupiter, north on Jupiter to start. North- Start at the east end of Sun Lake Rd., go west to the west end of Tarpon Way. East- From the west end of Tarpon, south to the point where Bottlebrush Rd. turns west to Kaileen Circle, south on Bottlebrush to Palm Bay Rd. South- From the intersection of Bottlebrush and Palm Bay, west to Pinewood Dr.
West- From the intersection of Pinewood and Palm Bay, north on Pinewood until it turns west, from this point north to beginning. North- Start at the Osceola and Brevard County line at a point due west from the intersection of John Rodes Blvd. and Ellis Rd., east from this point to the intersection of John Rodes and Ellis, south on John Rodes to Sheridan Rd., east on Sheridan to Wickham Rd. East- From this intersection of Sheridan and Wickham, south on Wickham to the Canal that is just south of South St.
South- From this intersection of Canal and Wickham, west on canal to the north-west corner of the boundary of the Acres of Diamonds Subdivision, south on this boundary line to US 192 (New Haven Rd. ), west on US 192 to the Osceola and Brevard County line. West- From the intersection of US 192 and the Osceola and Brevard County line, north to beginning. 4. 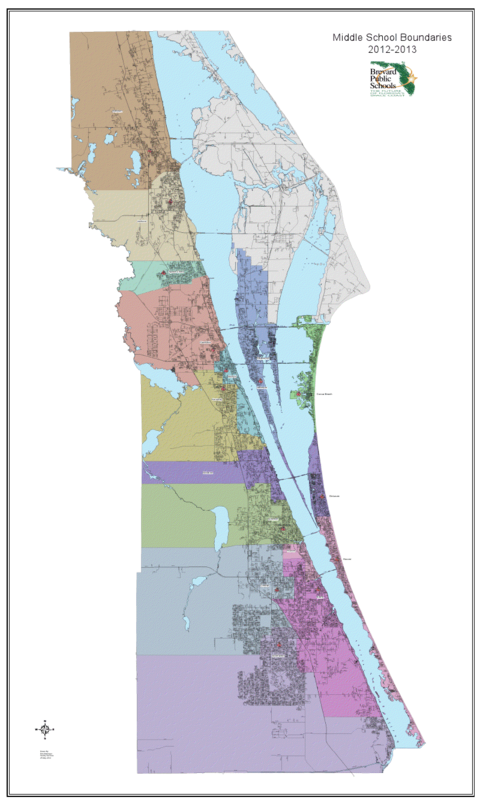 Redistricted from Roy Allen to Sabal will be all of the elementary students living north of Eau Gallie Boulevard, west of John Rhodes Blvd. and south of the intersection of John Rhodes Blvd and Aurora Road. North- Start at the north-west corner of the Vickers Subdivision No. 2 and Wickham Rd., east on this line to the south boundary of Lansing Ridge Subdivision Phase Four B., east on this line to Lansing St.
East- From the intersection of Lansing Ridge Sub. and Lansing, south on Lansing to Aurora Rd. South- From the intersection of Aurora and Lansing, west on Aurora to Wickham Rd. West- From this intersection of Wickham and Aurora, north on Wickham to beginning. 6. The Board approved grandfathering rising 6th graders at Meadowlane and Riviera. Proposal #8A - At the School Board meeting on January 24, 2012, the Board voted to approve the staff recommended Option A.
North- Start at the intersection of Volusia, Orange and Brevard County lines, east to the intersection of Carpenter Rd. and Garden St., east on Garden to US 1, east on CR 402 (A Max Brewer Memorial Bridge) to the Indian River. East- From the intersection of CR 402 and Max Brewer Bridge, south on the Indian River to a point east of the east end of South St and the Indian River. South- From this point west to the west end of South St., west on South to Fox Lake Rd., west on Fox Lake to I 95, south on I 95 to the south boundary, of the parcel, south of the intersection of I 95 and Fox Lake Rd., west from this boundary line to the Orange and Brevard County line. West- From this point, I 95 and the south boundary, of the parcel, south of the intersection of I-95 and Fox Lake Rd., north to the beginning. East- From the intersection of CR 402 and Max Brewer Bridge, south on the Indian River to a point east of the east end of South St. and the Indian River. South- From this point west to the east end of South St., west on South to Fox Lake Rd., west on Fox Lake to I 95, south on I 95 to the south boundary, of the parcel, south of the intersection of I 95 and Fox Lake Rd., west from this boundary line to the Orange and Brevard County line. West- From this point, I 95 and the south boundary, of the parcel, south of the intersection of I 95 and Fox Lake Rd., north to the beginning. Proposal #16A - At the School Board meeting on January 24, 2012, the Board voted to approve Option E.
North- Start at the north-west corner of the boundary for the Quail Haven Section 2 Subdivision, west on this line to the intersection of US 1 and Lionel Rd. East- From the intersection of Lionel and US 1, south on Us 1 to the intersection of Us 1 and Glenn Rd. South- From the intersection of Glenn and US 1, west on Glenn to the intersection of Glenn and Folsom Rd. West- From the intersection of Folsom and Glenn, north on Folsom to is end, north from this point to beginning. North- Start at the intersection of US 1 and Main St. (SR 46), east on Main to Hammock St., east from this point to the Indian River. East- From this point, east of the intersection of Hammock and Main and the Indian River, south on the Indian River to a point that is due east of the intersection of Cuyler St. and Hammock St.
South- From this point, which is due east from the intersection of Cuyler and Hammock and the Indian River, west to the intersection of Cuyler and hammock, west on Cuyler to US 1. West- From the intersection of US 1 and Cuyler, north on US 1 to the beginning. North- Start at the north-west corner of the boundary of the Orange Heights Subdivision and Old Dixie Hwy., east on this line to the east boundary of the Orange Heights Sub., east from thispoint to the west end of Silver Star Rd., west on Silver Star to US 1, west on Jess Parrish Ct. to its east end, from this point east to the Indian River. East- From the point that is east of the east end of Jess Parrish Ct. and the Indian River, south on the Indian River to the A Max Brewer Memorial Cswy. (SR 402). South- From the intersection of the Brewer Cswy. and the Indian River, west on Brewer Cswy. to US 1, west from this point now Garden St. to a point on Garden which is due south from the intersection of Old Dixie Hwy. and Kel Ave.
West- From this point, which is due south from the intersection of Old Dixie Hwy. and Kel, north to the intersection of Old Dixie Hwy and Kel Ave., north on Old Dixie Hwy. to the beginning. North- Start at a point on South St. which is due north of the east end of Kennedy Way, east on South to the Florida East Coast Railway. East- From the intersection of the FEC and South, south on the FEC to a point which is due east of the intersection of First Ave. and Warren Ct.
South- From this point which is due east from the intersection of Warren and First, west to the intersection of Warren and First, west on Warren to Second Ave., west from this point to the intersection of warren and Fourth Ave., west on Warren to its western end, from this point west to DeLeon Ave.
West- From this point on DeLeon which is west of the west end of Warren Ct., north on DeLeon to West St., west on West to its west end, north from this point to the beginning. North- Start from the intersection of Park Ave. and South St., east on South to a point which is due north of the east end Kennedy Way, south from this point to the west end of West St., east on West to DeLeon Ave., south on DeLeon to Sycamore St., east on Sycamore to the Florida East Coast Railway, north on the FEC to South St., east on South to its east end, east to the Indian River. East- From this point which is due east of the east end of South St. and the Indian River, south on the Indian River to a point which is due east from the east end of Harrison St.
South- From this point which is due east from the east end of Harrison St. and the Indian River, west to the intersection of US 1 and Harrison, west on Harrison to DeLeon Ave.
West- From the intersection of DeLeon Ave. and Harrison St., north on DeLeon to Day St., west on Day to Barna Ave., north on Barna to Park Ave., north on Park to the beginning. North- Start at the Intersection of Park Ave. and Barna Ave.
East- From the intersection of Barna Ave and Park Ave., south on Barna to Day St., east on Day to DeLeon Ave., south on DeLeon to Harrison St.
South- From the intersection of DeLeon Ave. and Harrison St., west on Harrison to Barna St., south on Barna to County Club Dr., west on County Club to Park Ave.
West- From the intersection of Park Ave. and County Club Dr., north on Park to the beginning. North- Start from the intersection of Barna St. and Harrison St., east on Harrison to US 1 (Washington St.), east from this point to the Indian River. 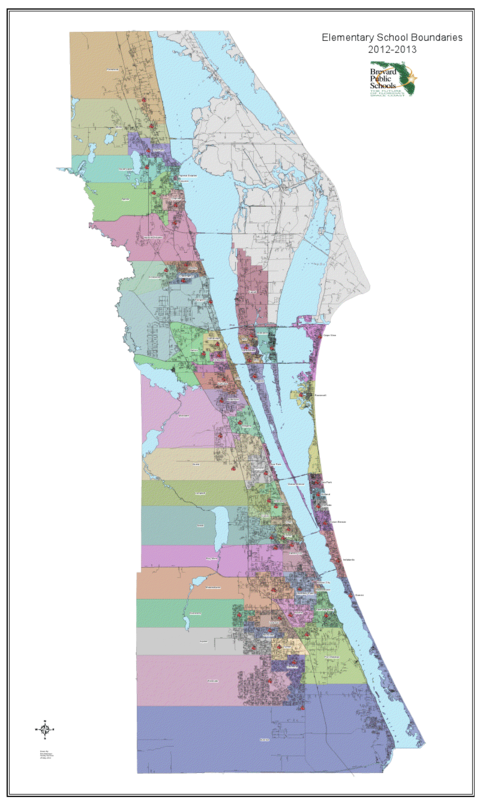 East- From the point that is east of the intersection of US 1 and Harrison St and the Indian River, south on the Indian River to a point which is the due east of the north-east boundary line of the Delespine Courts Section 2 Subdivision. South- From the point which is due east of the north-east boundary line of the Delespine Courts Section 2 Subdivision and the Indian River, west to this point, west on the north boundary line of the Delespine Sub. to the Florida east Coast Railway, south on the FEC to a point which is in line to Parker Dr., east from this point to the east end of parker, west on parker to Alpine Ln., west from this point to Raney Rd. West- From this point which is west of the intersection of Alpine Ln. and Parker Dr on Raney Rd., north on Raney to Sawgrass Dr., from this point follow the south boundary of the La Cita Homes Village Two Subdivision to the south-west corner of the boundary line of Las Verdes Townhomes Tract "F" Phase Two Complex, north from this point following the west boundary of Las Verdes Townhomes Tract "F" Phase Two Complex to it intersects with Country Club Dr., west from this point on Country Club to Barna Ave., north on Barna to beginning. North- Start at the centerline of the intersection of Sisson Rd. and Cheney Hwy. (SR 50), east on Cheney to US 1, east from this point to the Indian River. East- From this point which is due east of the intersection of Cheney Hwy and US 1 and the Indian River, south on the Indian River to Columbia Blvd. (NASA Cswy. and SR 405). South- From the intersection of the Indian River and Columbia Blvd., west on Columbia to Sisson Rd. West- From the intersection of Sisson Rd. and Columbia Blvd., north on Sisson to beginning.